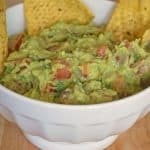 Sometimes I feel silly for posting simple things like guacamole because everyone seems to make their guac a little different. I know I like mine heavy on the avocado, light on everything else but my husband is the exact opposite. This is the recipe I use when I’m making it for people other than myself because it seems to be a good combination of everything. 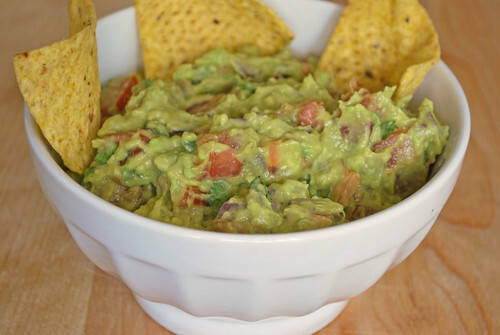 It’s delicious, quick, and it’s perfect on chips, tacos, salads, just about anything. 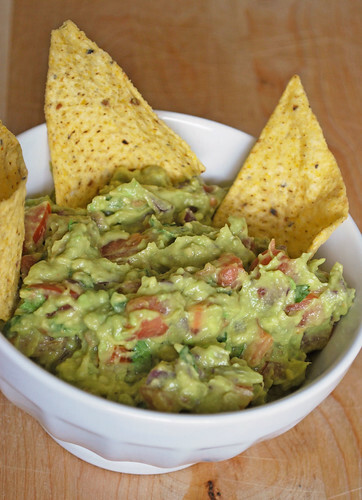 Cut avocados in half, remove seed, and scoop avocado from peel; put in medium size bowl. Mash with a fork until itâ€™s almost smooth (or as chunky as you prefer). Add in tomato, jalapeno, lime juice, and cilantro and stir to combine. Season with salt and pepper to taste. Serve with tortilla chips. Yes! The cilantro! I’ve had discussions about the use of cilantro in guacamole, which just further proves your point that everyone makes it differently. Though looking at your recipe, I make it the exact same way, even down to the lime. .-= Daniel´s last blog ..Eating Pain PoilÃ¢ne. Baking miches. =-.